Students from the Grade 12 University Biology class conducting DNA Extraction and Electrophoresis. 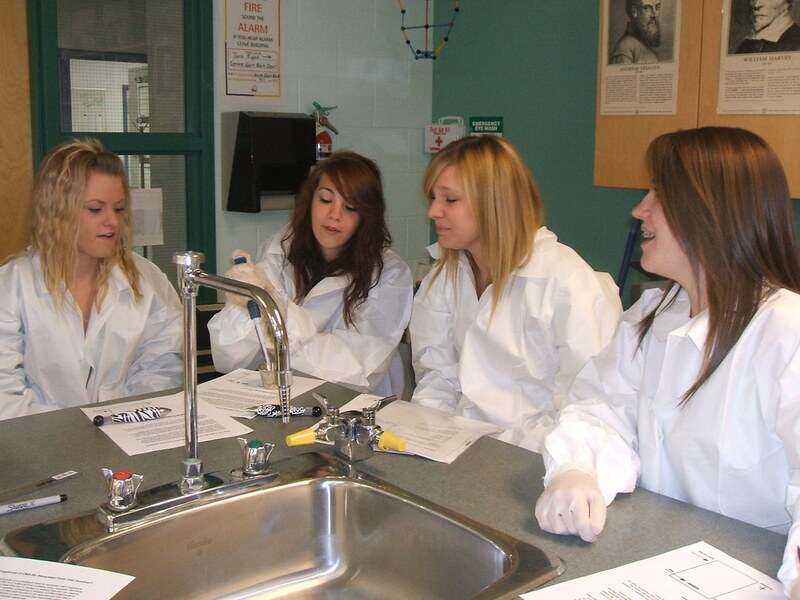 On Thursday May 27th and Friday May 28th Lakehead University visited 244 students and conducted hands on Labs with 11 different classes. The program that brought the PhD student and professor from Lakehead was called BioTrek and was funded by the Natural Sciences and Engineering Research Council of Canada. Dr. Heidi Schraft and Brenda Magajna, members of LU’s Science faculty, gave well-prepared presentations on one of four topics. Classes participated in one of 4 labs including “DNA Electrophoresis: Analysis of lambda DNA using gel electrophoresis” which illustrated the concepts of restrictions enzymes and DNA analysis, “Outbreak! – The spread of infectious disease and Glo Germ” which was an activity that simulates the spread of infectious disease, “Water Quality Testing – Toxicity Identification Evaluation (TIE)”, which demonstrated how to conduct a bioassay using Daphnia sp. (water fleas) and “Microbes! An Introduction to Microbiology and Build a Bacterium Scavenger Hunt” which introduced students to key concepts in microbiology, including a comparison of Eukaryotic and Prokaryotic cells, Gram staining, viewing motility under a microscope, and biofilm analysis.